Choice of sunglasses can be a fairly individual decision. Looking for comfort, performance and durability to make sure that your sunglasses not only help to enhance the quality of your training and racing, but don’t end up being a product providing more annoyance than benefit. This is an independent review to see how I thought the AMO sunglasses stack up. So far in my athlete endeavors I haven't been dazzled by top end sunglasses. More a case of price than choice, I have always looked for affordable, quality sunglasses. 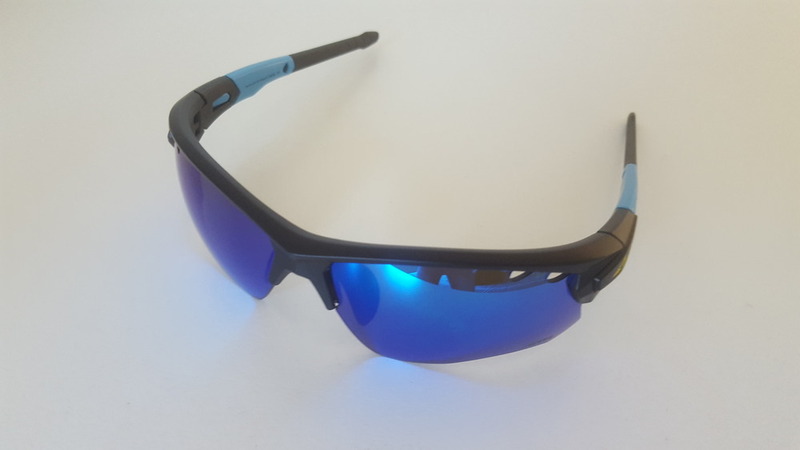 When in the market for sunglasses I’m looking for a product that's reliable, affordable, fits well to my face and is adaptable to different race conditions, suitable for cycling and running. In an Ironman I may spend between 7-8 hours wearing sunglasses, so I need to have confidence in what I’m wearing. Here I got to try the AMO Transformer series (Ironcatcher model). The Transformer sunglasses hit the spot with their much needed (and frankly expected) 100% UVA/UVB protection, adjustable TPR® nose pieces and anti scratch lens coatings. This has become fairly standard around the sports sunglasses market. Where AMO does well is their customer service, customisation, affordability and ease of use. The sunglasses are packaged very well (a nice first impression), a soft pouch and hard case provided giving a busy triathlete like myself enough durability to move between training bags without having to be too careful. The sunglasses are lightweight and strong, set to last you plenty of training and racing seasons to come and boasts a lifetime warranty. By far the most exciting and personal touch for me was the customised options. You get to choose the lens type, the lens finish, the colour of the changeable arms and the type of case included. The interchangeable lenses and arms gave a nice variety for varied use or colour coordination, handy also if you ever change equipment and colour scheme. It was quick and efficient to change out either piece, so no drama there for the less technically minded. My greatest concern with sunglasses in triathlon is the potential movement or slipping of the sunglasses caused by being in the time trial position on the bike with my head down, and the vertical movement when running. The adjustable nose piece and arms made it easy for me to tighten the glasses to fit my face shape if I found them too loose. My other common gripe of sunglasses is when they fog up, either on an early morning ride when the temperature is a bit cooler or during a race when I first get on the bike and it's not warmed up yet. The lens vents on the side of the Transformer glasses have prevented this from happening. On the run I was impressed with the secure fit. I was able to adjust the nose piece so that glasses remained static, the comfortable and adjustable arms fit nicely with my race cap too. All in all the Transformer series worked well for my needs in training and racing. As previously mentioned, never having owned a pair of more expensive, high end sunglasses my base point for quality is quite unbiased. I wonder whether one ride in a pair of Oakley's would change my mind? I'd be pretty keen to try other AMO models too, testing whether the fit and/or shape of their other sunglasses altered in their befits on the bike or run. Ultimately at this price, a purchase from AMO is probably going to be money well spent for the majority of athletes.